My goal as a teacher is to help my students achieve a good, consistent shot. The student must be committed to improve their game and take the necessary steps to get there. It is not an easy process, but with time and commitment anyone can learn. 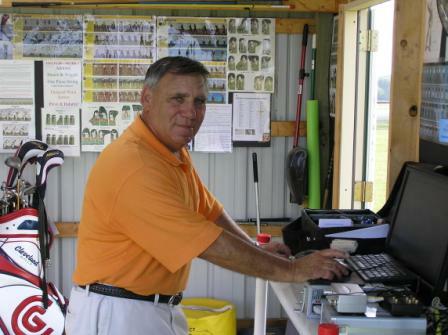 To me being a good coach means, “…taking it to the course with confidence.” And you can too! Robert Beck won the William Hyndman lll Senior Invitational with scores of 73-70-70 and won by 14 shots. Congratulations Bob. Amanda fires a 76 and won the Franklin County Junior Girls Championship. She also beat the best boys score of 77. Great Playing Amanda. Amanda Gerrish Wins Hershey CC junior Girls club championship and Ky Boreman wins Carlisle CC girls juniot championship, Amanda scored a 76 and Ky scored in the 80's. Both junior have won tournaments on the Junior Tour. Great improvement with there swings. JD Dornes scores 14 under Par and finished tied for 2nd, David Delinger scored 13 under par and finished 4th, and my son Mark scored 73-70-66 5 under and finished in the top 20, scores were the lowest in State history the tournament was won by Greg Jarmas with a score of 16 under par.